Moms, do you believe that you can be an amazing mother and a vibrant woman at the same time? In order to examine that thought, first I’ll need to retrace the steps of my own journey into motherhood… Within a few hours of discovering I was pregnant with my first child, I purchased multiple parenting books and subscribed to BabyCenter.com. Over the course of my first couple of years as a parent, I visited Pinterest often, frequented Mom blogs, and kept a file folder with articles that I felt were important to save for reference later. No one told you motherhood would be like this. Pressure, worry, exhaustion… not exactly what you signed up for. Do you worry that you’re doing it wrong? Motherhood is a task that requires your entire heart and soul. The most beautiful privilege in the world is also the most emotionally draining. It requires you to face your deepest fears of inadequacy and walk through challenges that often seem impossible. It requires you to be vulnerable, worried and completely overwhelmed (sometimes all at the same time). But, here’s the good news! You were never supposed to be perfect. Molly Claire is a life coach who primarily focuses on Moms as her clientele – coaching women through the challenges and stressors of being mothers and caregivers, helping them to reduce overwhelming feelings of guilt and stress. She offers private and group programs online to support women as they navigate motherhood, create life balance, and release perfectionism. 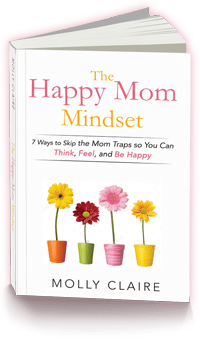 In her bestselling book, The Happy Mom Mindset: 7 Ways to Skip the Mom Traps so You Can Think, Feel, and Be Happy, Claire offers compassion, grace, wisdom, and gentle correction to encourage Moms toward a happier future. You’re on a powerful journey, and journeys take time—especially one this incredible. When the journey is hard, you might cry or lose your temper. You’ll question your decisions and feel remorse for each of the million and one mistakes that you make. Despite all of this, keep putting one foot in front of the other. Becoming a mom was not what I expected. Of course, in many ways, it was more than I could have ever imagined. Indescribable and magical, for sure. But when it came to “doing” motherhood… I wasn’t sure I was making the cut. When I became a mom, my son didn’t follow the “rules” in the baby advice books. He had colic, allergies, asthma, ear infections, rashes… and I lived with chronic migraines. How could my son have every complication known to man? And how could I be so bad at something I was sure that I was meant to do? The first time I heard Molly Claire reference “Mom Traps” I was worried that I’d probably identify with ALL of them, and feel that familiar “mom guilt” again. That’s the last thing I need during what has turned out to be a challenging season of life, emotionally, mentally, and physically. But upon reading the book, the description of each “trap” was surprisingly reassuring. Validating, even. I’m not alone. I’m human. I’m normal! I won’t be able to do Molly’s well-developed insights justice in the forthcoming brevity, but I’ll attempt to outline the seven “mom traps” to whet your appetite for her best-seller. Which, could turn out to be the best encouragement you’ve received in a long time. Molly challenges our “shoulds” and encourages that we question our to-do lists. How are we investing our energy and emotions? Can you identify with this excerpt from The Happy Mom Mindset? Just because your kids want something doesn’t mean they need it. Just because your kids think they need something doesn’t mean they do. Just because you think your kids need something doesn’t mean they do. Just because you are invited doesn’t mean you need to say yes. Just because it’s a “good cause” doesn’t mean it needs to be your priority. Just because you have an opportunity doesn’t mean you need to take it. Just because your child is sad doesn’t mean you need to fix it. There’s no denying the role of Motherhood is a full-time job, but we were never meant to be at their beck and call, abandoning our own needs. Molly poses the question, “Which ‘on call Mom’ are you?” The Annoyed Mom? The Frazzled Mom? Dr. Mom? Here’s a “mic drop” moment for Moms everywhere – YOUR KID’S HAPPINESS IS NOT YOUR JOB. Molly wants to help you understand that you simply cannot control the way your child feels. Even if you wanted to, it’s not possible. The quest to live up to great expectations to ensure your kids’success sounds, in theory, like great parenting, right? Except, challenges Claire, that it completely ignores the fact that you are human and your kids are too. It’s easy to blur the line between being a teacher, guide, and mentor to your kids and being the one responsible for creating their success. We tend to buy into the belief that if we execute parenting perfectly, our kids will make the best choices and achieve the most success. We think if we live perfect lives, they will have perfect lives, and everything will be… perfect. I’ve noticed in my own life that if I neglect my own emotions or weariness, eventually it spills out. And usually not in the sweetest of ways. Molly provides moms with practical steps to put themselves back in the drivers’ seat of their own lives. Self-care is important in all aspects of a woman’s life: physical, mental, emotional and spiritual. 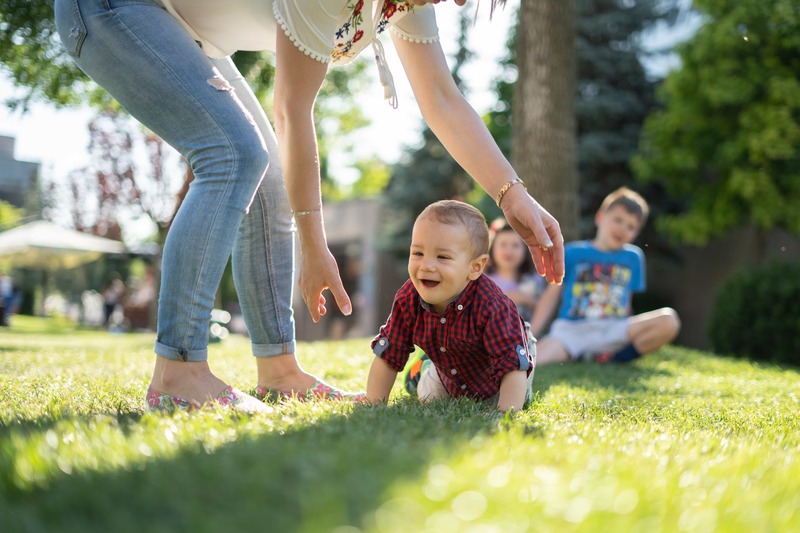 The “Happy Mom Mindset” is all about stepping into a place of creating joy and meaningful experiences along the way. It’s about understanding that within your circumstances is your internal experience that’s completely up to you. What you create within will manifest externally in your life as well. Wouldn’t it be great if someone could come alongside the average Mom and be a coach for those basic life issues that weigh her down? Molly Claire does just that. The Happy Mom Mindset is a sweet blend of grace, support, gentle correction, and challenging insights. Molly guides moms through a process of reframing the way they think about themselves, their emotions, and their purpose. Molly encourages readers to acquire the accompanying workbook, as well, to really walk through the practical application and further process the ideas presented in each chapter. In addition to her best-selling book and online life coaching programs, Molly Claire offers special programs for newly divorced moms to support them through that challenging transition. Who you are you makes you uniquely qualified to live your life and be the woman to raise your kids. What you do every day matters so much. Even when no one notices, and no one is thankful, it matters. The mistakes you make will be forgotten, but the lessons you teach will be remembered.